In celebration of Guillermo del Toro's must-see series DreamWorks Trollhunters coming to Netflix on Friday, December 23rd. From the limitless imagination of acclaimed filmmaker Guillermo del Toro comes a tale of two worlds set to collide in the epic saga DreamWorks Trollhunters. When ordinary teenager Jim Lake Jr. stumbles upon a mystical amulet on his way to school one morning, he inadvertently discovers an extraordinary secret civilization of mighty trolls beneath his small town of Arcadia. Suddenly destined to play a crucial role in an ancient battle of good and evil, Jim is determined to save the world – right after gym class. 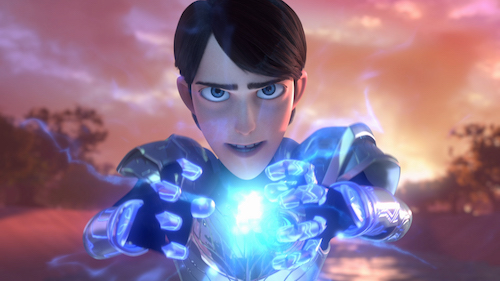 A must-see viewing event for the entire family, DreamWorks Trollhunters will bring viewers of all ages around the globe into the rich and creative world of this all-new Netflix original series, premiering worldwide December 23, 2016. Voice talent includes Kelsey Grammer (“The Simpsons,” X-Men: The Last Stand), Ron Perlman (Hellboy, “Adventure Time”), Steven Yeun (“The Walking Dead”) and Anton Yelchin (Star Trek Beyond). Trollhunters is created and executive produced by Guillermo del Toro (Crimson Peak, Hellboy). Marc Guggenheim (TV’s “Arrow,” “DC’s Legends of Tomorrow”), Rodrigo Blaas (animator Up, Brave, WALL•E), Christina Steinberg (Rise of the Guardians) and Chad Hammes (Dragons: Race to the Edge") serve as executive producers. Dan Hageman and Kevin Hageman are co-executive producers.